Though other talented folks have followed in his footsteps, Bryan Bowers continues to be the pinnacle of autoharp playing in the folk music world, and he delivers a fine mix of songs, instrumentals, and stories. Bryan will be in California for his annual visit to the California Autoharp Gathering in the Fresno area in May. We heard Bryan at the Fret House in 2017, and he continues to amaze with plenty of new songs in his repertoire. Born in Yorktown, Virginia, Bryan was profoundly affected by the singing of field and railroad workers, and this style of singing is an important part of his sound. 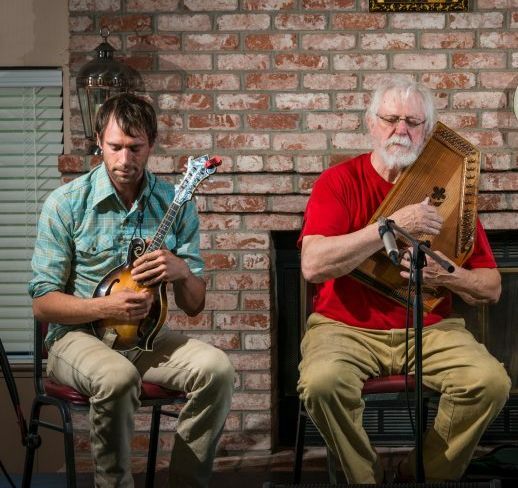 It wasn’t until college that he took up playing the autoharp, but he quickly became a master of the instrument that he has redefined over the years. He is as important to modern autoharp playing as Earl Scruggs has been to the banjo. In his hands, the autoharp has amazing capabilities of notes and chords, and his playing brings to mind a full orchestra, with its full-bodied and varied sound. He mixes a few original songs with some gospel, traditional, and songs of current songwriters, many of them very funny, such as “Zen Gospel Singing.” Bryan’s humor, easy manner, and natural storytelling abilities make his performances a pure delight. We just got word that Bryan will be touring and performing with Geoff Goodhue, mandolin player, now living in New Hampshire. Geoff tours with a group called Beg Steal or Borrow and he has performed with Tim O’Brien and others.